Received: May 9, 2018; Published online: June 30, 2018. Aurora B is an important kinase involved in dynamic cellular events in mitosis. Aurora B activity is controlled by several post-translational modifications (PTMs). Among them, E3 ubiquitin ligase-mediated ubiquitination plays crucial roles in controlling the relocation and degradation of Aurora B. Aurora B, ubiquitinated by different E3 ligases, moves to the exact site for its mitotic function during metaphase-anaphase transition and is then degraded for cell cycle progression at the end of mitosis. However, how the stability of Aurora B is maintained until its degradation has been poorly understood. Recently, we have found that USP35 acts as a deubiquitinating enzyme (DUB) for Aurora B and affects its stability during cell division, thus being involved in the regulation of mitosis. In this review, we discuss the USP35-mediated deubiquitination of Aurora B and the regulation of mitotic progression by USP35. Successful mitotic progression is tightly controlled by accurate coordination of chromosomes, microtubules, and membranes. During mammalian cell division, each daughter cell receives one of the two copies of each chromosome. If some errors occur in this process, new daughter cells can exhibit genetic instability and aneuploidy, consequently causing tumorigenesis. The ubiquitin-proteasome system is involved in the regulation of the activity of a number of mitotic proteins. In particular, modulation of the level and dynamic behavior of the Aurora B kinase, an enzymatic component of the chromosomal passenger protein complex (CPC), by ubiquitination is essential for key mitotic events, which include the regulation of kinetochore-microtubule dynamics, activation of the spindle assembly checkpoint, and completion of cytokinesis (Carmena et al. (2012) Nat rev Mol Cell Biol 13, 789–803). There are two main E3 ubiquitin ligases involved in Aurora B ubiquitination; APC/C and Cul3. The multi-subunit E3 ubiquitin ligase, APC/C permits cells to exit mitosis into the G1 phase via the ubiquitination of the Aurora B kinase for proteolytic degradation. At the end of mitosis, APC/C, activated by CDH1, can recognize and degrade Aurora B by assembling K11-linked ubiquitin chains (Stewart S et al (2005) Cancer Res 65, 8730–8735; Min M et al (2015) Mol Biol Cell 26, 4325–4332). Aurora B localizes to the centromere at early mitotic stages, but during the metaphase-anaphase transition, this kinase leaves the chromosome and moves to the central spindle microtubule. This dynamic localization of Aurora B is controlled by another E3 ubiquitin ligase, Cul3. Cul3 forms a complex with BTB adaptors, including KLHL9, KLHL13, and KLHL21, and ubiquitinates Aurora B at late mitosis. The relocation of Aurora B contributes to the completion of cytokinesis, facilitating chromosome decondensation and nuclear reformation (Sumara I et al (2007) Dev Cell 12, 887–900; Maerki S et al (2009) J Cell Biol 187, 791–800). The importance of ubiquitination in the regulation of Aurora B kinase activity prompted us to explore the potential roles of DUBs as regulators of Aurora B activity. DUBs have a reversible function in ubiquitination, disassembling ubiquitin chains attached to substrates and controlling numerous pathways involved in cell cycle progression, DNA damage responses, immune responses, cell death, etc. USP39 is associated with mRNA expression of Aurora B (van Leuken RJ et al (2008) Cell Cycle 7, 2710–2719) however, DUBs that have protease activity and regulate the function of Aurora B during mitosis are as yet unknown. Using high-throughput screening with siRNAs, we found that USP35 was involved in cell cycle control. Thus far, very little is known about USP35. Liu and colleagues have reported that USP35 inhibits cell proliferation via suppression of NF-κB activation by deubiquitination and stabilization of ABIN-2 (Liu C et al (2015) Oncotarget 6, 27891–27906). In addition, USP35 localizes to mitochondria and regulates PARK2-mediated mitophagy (Wang Y et al (2015) Autophagy 11, 595–606). However, the functions of USP35 in cellular responses, particularly in the cell cycle, remain largely unclear. In the current study, we report that the DUB USP35 regulates mitotic progression by blocking the APCCDH1-mediated degradation of Aurora B and maintaining Aurora B stability (Diagram 1). siRNA-mediated depletion of USP35 triggered an increase in several mitotic defects, including chromosome misalignment, lagging chromosomes, multipolar spindles and chromatin bridges. In addition, USP35 deficiency induced cytokinesis failure and mitotic slippage, resulting in severe nuclear abnormalities. These phenotypes, observed in USP35-deficient cells, were rescued by the expression of WT USP35 but not by the expression of a catalytically inactive form of USP35, USP35C450A, which indicated that the DUB activity of USP35 is required for the regulation of mitotic progression. Based on these results, we could surmise that there existed a specific substrate, affected by the DUB activity of USP35, acting as a regulator of mitosis. The Aurora B kinase is important for faithful mitotic progression, and mitotic errors found in cells lacking USP35 are similar to those caused by Aurora B inhibition. Indeed, USP35 could bind to and deubiquitinate Aurora B during mitosis. In addition, USP35 controlled Aurora B levels in a proteasome-dependent manner. Finally, almost all mitotic defects caused by USP35 knockdown were recovered by inducing expression of Aurora B, which suggested that USP35 could participate in mitosis via regulation of Aurora B levels. Interestingly, USP35 suppressed the CDH1-induced ubiquitination of Aurora B and restored the protein levels of Aurora B decreased by CDH1. Based on the results, we concluded that USP35 counteracts the APCCDH1 effect on Aurora B. Additional ubiquitination of Aurora B by a Cul3-based E3 ligase alters the localization of Aurora B during mitosis. 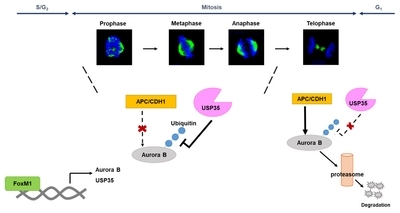 Although USP35 did not modify this ubiquitination of Aurora B, it is unclear whether USP35 is associated with the regulation of Aurora B localization during mitosis. USP35 could regulate histone H3 phosphorylation at Ser10 by Aurora B, indicating that USP35 affects Aurora B downstream signaling. Histone H3 phosphorylation is important for chromosome condensation at prophase and during cell passage from metaphase to anaphase (Hans F et al (2001) Oncogene 20, 3021–3027). Hence, we demonstrate that at least the decrease in the number of mitotic cells and the mitotic delay exhibited in USP35-depleted cells are caused by reduction in the Aurora B-promoted histone H3 phosphorylation. Finally, we determined that USP35 expression was regulated by the FoxM1 transcription factor during the cell cycle. However, we do not know the molecular mechanism of regulation of the activity or expression of USP35 during mitosis. Overall, we believe that USP35 is a novel DUB regulating Aurora B levels and function, and therefore, controlling the whole mitotic progression. This work was supported by the R&D Convergence Program of NST (National Research Council of Science & Technology) of Republic of Korea (CAP-16-03-KRIBB). Fig. 1. Schematic representation of the USP35 and involvement in mitotic progression. USP35 blocks the APC-mediated ubiquitination of Aurora B and maintains Aurora B stability during mitosis. At the end of mitosis, CDH1-activated APC ubiquitinates Aurora B and induces its proteolytic degradation. The expression of USP35 is regulated by the FoxM1 transcription factor.